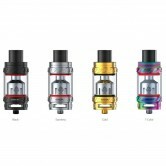 The SMOK TFV8 Cloud Beast Tank is the ultimate rendition of SMOKTech's goal of reinventing the Sub-Ohm Tank platform, implementing a top-level apparatus that excels in the use of extremely high power output alongside 6mL juice capacity, unique patented SMOK Turbo Engines coil structure, adjustable dual bottom airflow, signature hinged top-fill system, and heat-spoofing Delrin ultra-wide drip tip. SMOKTech has built a revolutionary system with an explicit focus on creating a powerful, high-caliber system with unparalleled cloud-chasing potential, starting with the patented Turbo Engines coil structure: featuring the V8-T10 (10T), V8-T8 (6.6T), V8-T6 (6.0T), V8-Q4 (5.0T), and the V8 RBA (4.0T-X). The crowning achievement resides in the SMOK V8-T8, featuring an octuple design in vertical orientation and capable of firing up to a staggering 260W for absolutely massive vapor production. The V8 RBA rebuildable head integrates a massive 18mm build deck with a two-post, dual terminal design sitting on top of dual internal airslots, allowing for massive airflow in conjunction with the external airslots. 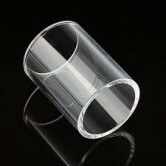 Airflow is fed into the atomizer chamber from dual massive airslots, with a precision airflow control ring to throttle and practically cool the system as a whole. The TFV8 adopts a highly effective chimney, increasing the spacious internal barrel for higher airflow efficiency. It utilizes an ultra-wide Delrin widebore drip tip with immense cooling properties and heat-spoofing capability during high wattage operational usage. The signature top-fill architecture is designed with a hinge-and-lock system without the need of threads and convenient refills with a 6mL maximum juice capacity. FreedomSmokeUSA.com and any or all of FreedomSmokeUSA.com’s parent and subsidiary companies will not be held responsible or liable for any injury, damage, or defect, permanent or temporary that may be caused by the improper use of a Li-ion (Lithium-ion), LiPo (Lithium-ion Polymer) and any rechargeable battery/batteries as well as chargers.  Please have a greater understanding of the batteries/chargers you are using and how to care for them properly. 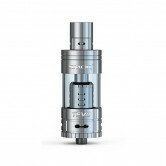 The SMOK TFV12 Beast Tank has a 27mm diameter body. The newest TFV12 Sub ohm tank has the largest cloud-chasing replaceable coil heads: V12-T12 (duodenary coils) and V12-X4(quadruple coils) and V12-Q4 (quadruple coils). The V12-T12 coil head contains duodenary coils feature a twelve cylinder design in vertical orientation, capable of firing up to 350W but it is best used in an optimal range of 130 to 200W. 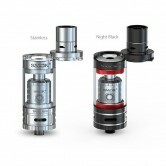 The architectural structure of the TFV12 Sub-Ohm Tank evolved, upgrading the size of the base and the dual air slots which increase airflow area for maximum cooling. 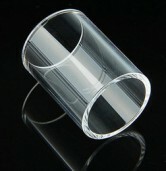 The material of the glass is made from food-grade material that is resistant to high-temperature. Precision welding in a tri-dimensional pattern was used for the chassis. The signature top-fill, rotary hinge-and-lock system return for a truly ergonomic refill process which means no threading or removal of a top cap for ease in re-filling. 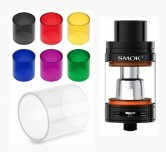 The SMOK TFV12 Beast Tank is exceptionally crafted and designed.